When you want a wig, you shouldn’t go to the dollar store and buy a cheap halloween wig. Let me tell you, wig from the dollar store is always made of terrible material and it wasn’t even shaped like a head. It also had a huge bump on the back and was uber wavy. We somehow managed to turn it into an awful wig. Don’t be afraid to go shopping online and get a good one. That’s the way to go. I highly recommend L-email wigs. People around me all bought our wigs from there and they are amazing. They are soft, realistic and styled REALLY nicely. HIGHLY, HIGHLY, HIGHLY RECOMMEND. 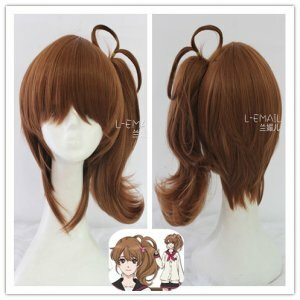 Also, when buying a wig, if you’re cosplaying someone with long hair in twin tails/a ponytail (for example, Miku, Gakupo, Black Rock Shooter) make sure you get a wig with wig clips. It’s also easier to get a nice, neater looking ponytail. I saw this online, and I really think you should try it. You put your base wig. Then, you clip your wig clips over the little twintails. This helps because then it makes the wig clips look more like twintails and less like you just put some wig clips on. 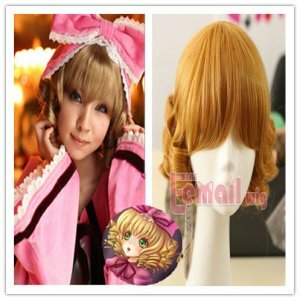 This entry was posted in Buy Cosplay Wigs, Fashion Wigs and tagged cosplay wigs, fashion wig, great cosplay ideas.